The Forex-Center MT4 EA is a forex expert advisor. The Forex-Center automated forex trading software for the MetaTrader platform has been forward tested on a live account by the Forex Peace Army. 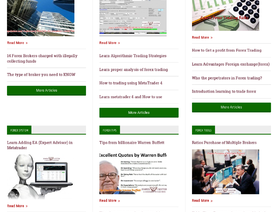 The Forex-Center.net forex robot has scalping and snipper features. Update to my review: In spite of initial non-response for a long time, i went ahead and purchased the EA so i can see for myself if it performs as it does here, on FPA. Well, i set it up to trade the same pairs that are tested here, with no other parameters changed , only the lot size as i am running it on live so the compared results are adequate to what is shown here. My results have been completely different! First of all, the losses here do not exist. Whereas on my account , i have had a few, they are not huge, but there are few of them. What is different here ? How come there are no losses on this account? Secondly, it keeps opening more and more positions an different directions , for example, i currently have 8 positions on usdjpy, 7 on usdchf, 5 on gbpusd , 3 on eurusd and 3 on eurjpy. Thats a total of 26 positions! Beware of this test as i do not believe this is a true test . The developer/seller must have different setting on his . BEWARE! I can only report positive here. Very quick answer to my questions. Very fast activation of the robot. Very good performance. I am not happy with the adviser and a support service. Accounts don't coincide. I will come back and update my comments in a couple more months. I also had problem with contacting owner (had to wait 2 days, but after that I contact him on MyFxBook). He have some problem with his contact form on his Site and he is trying to solve the problem now. I am just in process of buying that EA, and will update my review in a week or two. However, for now I am very satisfied with conversation. He seems (don't know his name) very polite and professional in his answers. For now, I am giving 5 starts, but as I said, I will update my review later on. P.S. If you try to contact him these days, please be patient, because he is trying to solve the problem on his Site (contact form).